Valkyria Chronicles fans, we have good news. Sega has begun to tease something Valkyria Chronicles related, meaning, well, we actually have news that Valkyria Chronicles news may be coming. Yes, this is why they call these things "teasers." The official Sega blog points fans to the equally official Valkyria Chronicles Twitter and Facebook accounts, which are taunting fans with the phrase "W _ _ _ - _ _ _ _ - _ _ _ _ _ _ - _ o _ _ _ - _ _ _ _ _ _ ." As Sega marketing types have begun to replace those blank space with letters, it's becoming more and more likely that phrase is "what goes around comes around." What could that mean? Well, likely one of two things. One possibility is that the final batch of Valkyria Chronicles downloadable content, released in Japan this summer, is coming stateside. 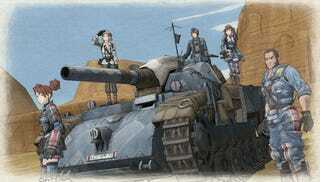 The other is that Valkyria Chronicles 2 will make an appearance in North America. After all, the PSP does "go around" and, despite the platform change and differing artistic styles, we're guessing Valkyria Chronicles fans would like to get their hands on the sequel. Of course, there may be a third option we're not considering, but we'll continue to watch this space.